Four boxers and three coaches from Oughterard Boxing Club travelled to Aalborg in Denmark on January the 4th to compete in the International Club competition the Viking Cup. They were Colm Molloy,Kieran Molloy, Mathew Tierney and Cillian Tierney. There were entries from Ireland, England, Holland, Germany, and Denmark to name but a few and the calibre of boxers was always going to be high. First up for Oughterard was Colm Molloy who at the age of 15 was up against an opponent two years his senior and for the first time ever boxing 3 x 3 minute rounds. Colm took two big hits in the opening exchanges but settled himself into the fight and after the first round came out determined to keep his opponent on the back foot. This tactic worked with Colm level on points at the end of the second round. The longer rounds did eventually take their toll on Colm and he was narrowly defeated in the finish. Amazing performance considering the age of his opponent plus experience of over 70 fights. Mathew Tierney who is the current boy 1 36kg All Ireland Champion fought on the Saturday the 5th against German opponent Kbitko Wladislaw. Mathew got off to an impressive start never letting his opponent settle into the bout. This early pressure paid off as the referee stopped the contest before the end of the first round earning Mathew gold and the first of two for Oughterard Boxing Club. Next up was Kieran Molloy v Artur Mamberger in what was to be a repeat of the European Schoolboys semi final where the German came out on top. Kieran was determined to lead from the off and straight away started at a high work rate. The German was every bit his match up to mid point of the fight but with Kieran being able to increase the pressure on his opponent , he took the lead with the fight having being level at the end of the first round. This was a great victory for Kieran and he was deserving winner in the finish. 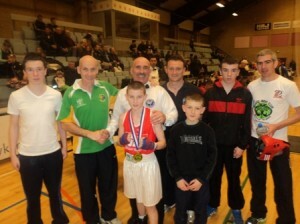 On Sunday the 6th he won his bout against Frankie Donavan of Olympic boxing club to earn Gold. Un fortunately there was no bout for Cillian Tierney but a great experience for him at the age of 11 to see boxing at this level. This page was added on 15/01/2013.